Note: To ensure proper operation, please read user guide carefully before using. ● For those clients who experience the 3D printer pen for the first time, the experience effect may not very ideal, but it doesn't matter, because they just haven't used to use 3D printer pen to create. please be patient and use your imagination, you will find its a very magical process. ● Please search key words "3d printer pen" on YouTube, there are many outstanding creative processes and methods for your reference. ● Always unload the filament when you are done with your Art Work / Drawing for the day. Package included: 1* 3D pen, 1*USB cable, 1* power adapter, 1* 20ft PLA filament, 1* pen holder 3D Printing Pen, which can be used to draw a 3D project to bring your designs from paper to real life. 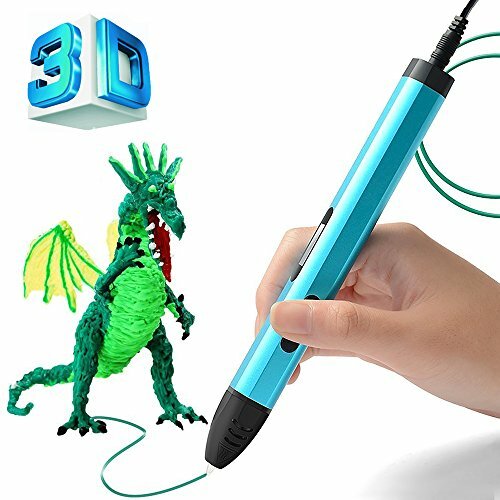 The 3D printing pen is suitable for children over 6 years old and adult. Used by children must be under instruction of adult. Creation in 3D: Draw vertically. Draw horizontally. Lift your imagination off the page! The Printing Pen extrudes heated plastic, which instantly hardens, allowing you to literally draw in 3D, freehand or on paper. Change colors quickly and easily. The possibilities are endless. Adjustable Low to High Temperature and Speed - Our 3d BIHUO printing pen is compatible with both PLA & PCL Filament. Please use with PCL filament when you choose low temperature mode, and use PLA filament when choose high temperature mode. The Aircraft-grade aluminum 3D printing pen enables you control the temperature and speed when you enjoy drawing. To ensure proper operation, please read user guide carefully before using.Please thoroughly exit out of 3D Pen Filament Refills before you change filament color and after use;Do not touch nozzle before the 3D printing pencil cooling more than 3 minutes. Perfect after-sale protection! - BIHUO 3D PEN enjoy 30 days of unconditional full refund policy, 1 year Warranty and whole-life customer service. Please refer the User Manual before use. If you have any questions about this product by BIHUO, contact us by completing and submitting the form below. If you are looking for a specif part number, please include it with your message.